Parking is available in designated parking lots along the canal towpath. The main canal runs from Trenton to New Brunswick with a break at the Route 1 crossing. The feeder canal stretches from Trenton north to Frenchtown along the Delaware River. The park office is located at 145 Mapleton Road. Exit at Route 522 east (Ridge Road) heading towards the town of Kingston for approximately 1 mile. Make a left turn onto Division Street. At the stop sign turn left onto Academy Street (Academy Street becomes Mapleton road). The park office and Mapleton Preserve is located .2 miles on the left side of the road across from the Mapleton Nurseries. Turn onto Academy Street at the traffic light in Kingston (across from the Kingston Cemetery). Academy Street becomes Mapleton road as it heads towards route 1. The park office and Mapleton Preserve is located .3 miles on the left side of the road across from the Mapleton Nurseries. The towpath and recreational facilities at D&R Canal state park are partially accessible for persons with disabilities. Please contact the park office for further information regarding disability access needs. Text telephone (TT) users, call the New Jersey Relay Service at (800) 852-7899. Please be advised that Canal Road will be closed between the hours of 9:00 AM to 4:00 PM on the above mentioned dates from Coppermine Road to Route 518. Appropriate detour signs will be at Coppermine Road and Route 518. This is necessary to place the dredges and floating excavators into the Canal. The equipment will arrive on a truck and be placed into the Canal by crane. Since heavy equipment (Crane, Excavator, and Dredge machine) will be in the road, vehicles will not be able to pass the work area near the pedestrian bridge over the Canal at Little Valley Stables near 1345 Canal Road. The road will be open to local traffic only from the detour point to the work area. Thank you for your patience as we make these necessary improvements to the Canal. 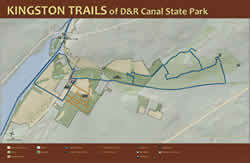 Use to locate the available D & R Canal State Park parking areas. This charming 19th-century mill complex contains both grist and linseed oil mills. The site is leased and operated by the Delaware River Mill Society, which sponsors concerts and other programs on site. For information about programs, call (609) 397-3586. The wooden canal bridge, the Mule tender's Barracks, the Bridge tender's House and station and the site of the Griggstown Mill are situated along the canal. Canoes can be rented at a private canoe rental concession on the canal. The Griggstown Lock is less than a mile south on the towpath. A short walk brings you to grassy fields with picnic tables and grills. The Bridge tender's House, wooden bridge and mill site are reminders of the area's active past. Several annual events are held at the house. Picnic tables and grills are located around a large field with views of the river. This historic site provides access to the canal, towpath and river. Griggstown and Blackwells Mills are located between the Millstone River and the D&R Canal and can be reached off Route 533, Millstone River Road in Hillsborough or from Canal Road in Franklin Township. 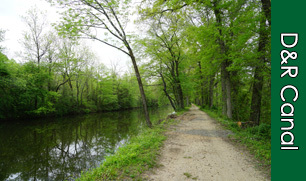 Both historic sites provide access to the Millstone River as well as the canal and towpath. Trail heads for Six Mile Run Reservoir are nearby. Horse trailer parking is available. This area displays a deciduous lowland hardwood forest adjacent to the Heathcote Brook in Kingston. A short trail takes visitors to the forest and small ponds. 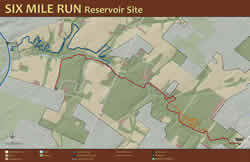 The Six Mile Run Reservoir Site, is one of Central New Jersey's most hidden recreational resources for hiking, biking, horseback riding and Hunting. The 3000 acre reservoir site, rich in cultural and historic significance, is also a valuable oasis of wetlands, forests, farmlands and old fields. The Park staff offer a variety of historical and natural interpretive programs throughout the year. Contact the park office for a schedule of programs. Program fees may apply. 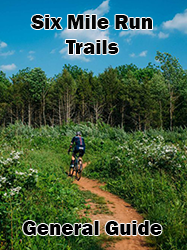 The towpath and multi-use trails are great for all ages and physical abilities. 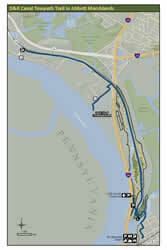 Both the Main Canal Trail, which runs 34 miles in length, and the Feeder Canal Trail at 31.5 miles are ADA accessible. Picnic table and grills are located at some of the access points and near a few of the historic sites. Informal picnicking is allowed along the canal. Open fires are not permitted. Charcoal fires are restricted to the grill in the picnic areas. 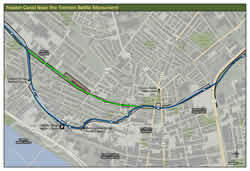 The historic towpath found along the feeder and main canal is suitable for hiking, jogging and biking. Horseback riding is permitted on the main canal only. Motorized vehicles or ATV's are not permitted on trails in the park. In addition to the canal trail, patrons can access trails at the Six Mile Run Reservoir Site, Kingston greenway and Cook Natural Area Trails from the park office located in Kingston as well as one trail found within the Bull's Island Natural Area. Fishing is permitted the entire length of the canal. Anglers can find bass, sunfish, catfish, perch and pickerel within the canal as well as trout, which the Division of Fish and Wildlife stocks the canal with each spring. Fishing is also permitted in the Delaware River. All canal and river fishing is subject to the New Jersey Division of Fish and Wildlife regulations. A Launch Ramp fee is in effect from Memorial Day to Labor Day. Canoes, kayaks, boats, vessels and personal watercraft (e.g. jet-skis) that are transported in any manner are subject to launch ramp fees. Required daily or annual permits can be purchased at the Bulls Island Main Office at 2185 Daniel Bray Highway, Stockton, NJ 08859. For further information, call 609-397-2949. There are no motor restrictions on the river, but all the New Jersey boating regulations apply. There are restrictions on boating and canoeing on the canal. Only electric motors, car top launch, and canoes are permitted, which, can be rented from private concessionaires in Griggstown and Princeton. What are the park hours? Park hours are sunrise to sunset.